April 26 - RSVP now! "Imagine IMPACT: An emerging strategy to strengthen the arts, culture, and conflict transformation ecosystem"
Read the latest issue of our newsletter, Peacebuilding and the Arts Now. Sign up to receive updates about the Peacebuilding and the Arts program and the Acting Together project. Film Screening: "Walk in my Shoes"
Featured News from the Field Theme: "The Impact of Authoritarian Regimes on Artistic Freedom and Expression"
Past News from the Field Theme: "Artists Respond to Climate Change"
Past News from the Field Theme: "Creative Reflections on Human Migration"
"Arts and Building Peace: The Basics and Envisioning the Future"
Read more News from the Field. Video: Interview with Catherine Filloux about her new play "SELMA '65"
Don West unveils portrait of Jane and Hubert Sapp at "Seeking Lives of Purpose"
Read reflection by Cindy Cohen: "Synergy: Women, Creativity & Peacebuilding"
Read review by Anthony Ellis of the Acting Together anthology. Find out about "Acting Together" screenings near you. "We lost one of our artistic fathers last month: John O’Neal, founding member of The Free Southern Theatre and founding artistic director of Junebug Productions, has gone on to dance with the ancestors. Without John’s vision, work, example and mentorship, ArtSpot would be a different company. His way of combining art and activism; his processes (especially the story circle) for creating work; his founding membership in Alternate ROOTS; his relationships with funders, presenters and colleagues outside of New Orleans as well as here on the ground; his inclusion of young white artists like myself in the struggle for racial equity and Black liberation have all deeply informed our work. Even on an administrative level, Junebug served as our fiscal sponsor for the first several years of our company’s life..." Read more from ArtSpot Productions. Also read the Program in Peacebuiding and the Arts tribute in the March 2019 newsletter. The minor in Creativity, the Arts, and Social Transformation (CAST) and Brandeis University’s International Center for Ethics, Justice and Public Life (The Center) invite applications for a full-time 9-month position to provide intellectual leadership for our dynamic interdisciplinary minor and to serve as Assistant Director of the Program in Peacebuilding and the Arts, housed in The Center. This is a non-tenured, three-year position, pending positive review at the end of the first year, with potential renewal at the conclusion of three years. The role includes teaching, coordinating faculty development, student advising, planning CAST events, research and creative activities, as well as administrative responsibilities. It is possible that, over time, the position could become year-round. CAST and The Center will offer communities of inquiry supportive of this faculty member’s own research and creative work, ideally at the intersection of practice, reflection and analysis. Read the full position description. Review of applications will begin on Monday, February 25. March 1, 2019 is the final deadline. Learn more about the minor in Creativity, the Arts, and Social Transformation (CAST), LaShawn Simmons, and about Ebony Axis. The Andrew J. Mellon Foundation is supporting an 18-month planning process to design an infrastructure that will leverage university-based programs and cultural institutions to support practice, policymaking, research and teaching in the field. The need for an infrastructure that will strengthen practice and inform policy in this arena, by, for instance, documenting excellent practice, offering training and education, facilitating exchanges, coordinating responses inn case of artists at risk of human rights abuses, and addressing questions of evaluation and ethics. The value of a network, consortium or organization of stable educational and cultural institutions that will serve as resource centers and as anchors for the more fluid network of individual, initiatives and organization working in communities on the ground. Learn more about Impact: Imagining Together. This special report includes initiatives and projects that are part of Peacebuilding the Arts program network such as Arlene Golbard's writing on Medellin, the example of the United States Department of Arts and Culture, Ajoka Theatre in Pakistan, Theatre Without Borders, Lena Schlachmuijlder's research on work in Burundi (undertaken while she was a Brandeis International Fellow from 2002-2004),and Ruth Margraff's and Polly Walker's contributions to Acting Together: Performance and the Creative Transformation of Conflict. The Special Rapporteur in the field of cultural rights addresses how actions in the field of arts and culture can make significant contributions towards creating, developing and maintaining societies in which all human rights are increasingly realized. "By engaging people and encouraging their interaction through artistic and cultural expression, actions in the field of culture can open a space in which individuals and groups can reflect upon their society, confront and modify their perception of one another, express their fears and grievances in a non-violent manner, develop resilience after violent or traumatic experiences, including human rights violations, and imagine the future they want for themselves and how to better realize human rights in the society they live in. The increased social interactions, mutual understanding and trust that can be built or rebuilt through these initiatives are essential to achieve a range of human rights goals and to respect cultural diversity." Read more (in multiple languages). Coming soon! The Jane Sapp songbook features sheet music, lyrics, and the stories behind 25 songs that Jane composed with young people in communities across the country. The podcast series expands on these stories in interviews with Jane and special guests, and also features recordings of the songs. Sign up to receive email updates about the songbook and podcast series. In the borderland between human suffering and human possibility we find artists, cultural workers, justice-seekers and peace-builders engaged in acts of courage, creativity, beauty and power. Brandeis’s minor in Creativity, the Arts, and Social Transformation (CAST) engages students in interdisciplinary exploration of the stories, the people, the actions and the artworks that animate this boundary. To learn more about the minor and the questions it poses, visit go.brandeis.edu/CASTminor. In the fall of 2016, the CAST minor anticipates awarding up to four grants of up to $500 each for projects proposed by students currently or previously enrolled in the introductory course, or who have taken the earlier course entitled The Arts of Building Peace. The purpose of these grants is to recognize exemplary creative, scholarly and activist work at the nexus of arts, culture, justice and peace, and enable students to engage in further creative work and theoretical and practical learning about questions that are central to the minor. The award provides funds for activities that will take place between the end of the fall semester and April 1, 2017. Applications will be due on 11:59 on Sunday, November 29, 2016. Read more about the grant opportunity. Read examples of past recipients. "Professor Cynthia Cohen is a noteworthy intellectual, who has made major contributions to both Brandeis and the world. The current director of the Peacebuilding and the Arts program and the acting director of the Ethics Center, Cohen has also created the Creativity, the Arts and Social Transformation (CAST) minor at Brandeis. Cohen has been working at Brandeis and studying coexistence and the arts since 1997. During this time, she says that the students at Brandeis inspired her with the idea to create the CAST program. 'As I came to know Brandeis students, I realized how many of them were interested in both contributing to social justice and cultivating their talents as artists,' Cohen says..." Read more. "This year, the co-convenors and advisors of the Art & Peace Commission have made the difficult decision of not attending the IPRA conference in Sierra Leone. We sincerely hope that the situation will be resolved by the time of the next IPRA conference in 2018, but in the meantime, we have reached a consensus that it was imperative to show our disapproval of the authoritarian type of management displayed by the current leaders. For instance, we thought that the way in which the IPRA leadership attempted to remove some Commission Convenors from their positions, and appoint new ones, without adequate consultation, was detrimental to an organization purporting to support peace by peaceful means. In any case, it is now too late and it seems that IPRA is moving ahead as if nothing had happened, so we have decided, with considerable regret, to refrain from attending the conference in November and December 2016 in Sierra Leone. At the same time, we recognize the value of the commission to its members and to IPRA as a whole, and we are not discouraging others from participating. Looking forward to 2018, we'll be happy to continue exchanging news and reports on activities and research with all members of our Art & Peace Commission through our facebook page and many other ways. Many thanks for your continued support." "Germaine Ingram is an activist and tap dancer as well as the keynote speaker for ’DEIS Impact. She spoke with Cindy Cohen, the director of Brandeis’ Peacebuilding and the Arts program, about the importance of art in the midst of conflict on Wednesday, Feb. 3. The conversation centered around Ingram’s experience as the head of a legal team in the Philadelphia school district..."
Read full article in the Brandeis Hoot. 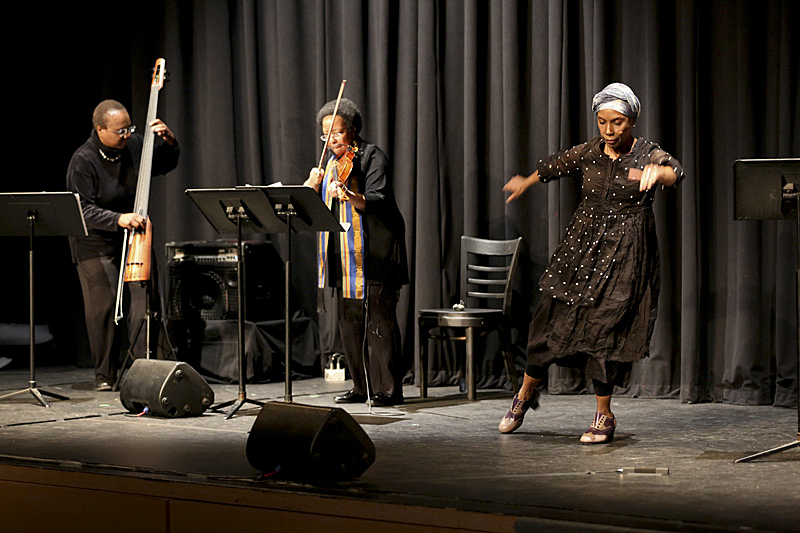 In the keynote address for 'DEIS Impact, Germaine Ingram delivered a speech that examined issues of social justice in the legal arena and offered her interpretation of the artistic experience, all interspersed with music and dance performances. It was an appropriate combination for Ingram, who is both an acclaimed jazz tap dancer and an accomplished civil rights lawyer. Before turning to her performance career full-time, Ingram practiced law for 30 years, litigating employment discrimination class action suits, and challenging policies and practices that limited employment opportunities for women and minorities...."
Read full article from Brandeis NOW. "For civil rights lawyer Germaine Ingram, life is equal parts scholarship, art and social justice; her tap dancing performances often focus on historical and social justice themes, and her lectures draw upon her years spent pursuing justice in court. On Feb. 3, Ingram will bring these themes together as she delivers the keynote address for ’DEIS Impact 2016. This year marks the fifth annual ’DEIS Impact, an 11-day celebration of social justice. The festival, which includes events hosted by clubs, student organizations and community groups, is put on as a collaboration between the Student Union and the International Center for Ethics, Justice and Public Life. Ingram will be performing “Freedom Underfoot” —about the final year of the Civil War in Atlanta — on Feb. 2 and will give her address, “The Law and the Stage: Platforms for Pursuing Social Justice,” on Feb. 3. Additionally, McPhee noted that the invitation is decided jointly, due to the collaborative nature of ’DEIS Impact and given that it is a partnership between the Student Union and the Ethics Center. She added that the talk and performance are also part of the Student Support Services Program’s 25th anniversary celebration, and will be co-sponsored by Brandeis Posse and the University’s new interdisciplinary minor in Creativity, the Arts, and Social Transformation..."
Read full article from The Justice. During rehearsals of 'for colored girls who have considered suicide / when the rainbow is enuf,' a play presented by Brandeis Ensemble Theater this past March, LaShawn Simmons '18 began to conceive an idea to keep the collective creative juices flowing. Simmons, a Posse Scholar majoring in African and Afro-American studies with a minor in sexuality and queer studies, found that the arts offer disarming ways of open, challenging discussions on issues race and gender, and began to think of other ways to engage people through the arts. Simmons' inspiration led to the founding of Ebony Axis, a poetry zine for black women on campus. The seed for Ebony Axis was planted during the play's production, but the concept was brought to reality through the first round of Creativity, the Arts and Social Transformation (CAST) student grants...."
"Among the many ways that Brandeis enacts its commitment to social justice is through the arts. 'Recognition of the contributions of arts and culture to peace is real and growing,' writes Cindy Cohen, director of the Program in Peacebuilding and the Arts..." Read more and view the full issue. "After performing in 'for colored girls who have considered suicide/when the rainbow is not enuf' last fall, Lashawn Simmons ’18, a Posse Scholar, decided to create a zine, Ebony Axis, that contained poetry from black women on campus. To celebrate the launch of her publication and its contributors, a coffeehouse was held at Chum’s over the weekend, with students watching the performances from outside because it was so crowded. The party was a showcase of poets, dancers and singers who shared pieces on blackness, womanhood and the intersection of both." Read the full article. Read more about the CAST minor. The Program in Peacebuilding and the Arts provided small grants designed to provide support to five college and university educators as well as trainers of theater practitioners to support the incorporation of the resources of the Acting Together Acting Together Project into their course curricula and workshop sessions. Acting Together resources were sent to educators and trainers in Canada, Colombia, Democratic Republic of Congo, Nepal, and the Oglala Lakota College in South Dakota, USA. Read updates from about how the recipients are using the Acting Together resources. We explored songs and stories surrounding the passage of the Voting Rights Act in 1963, and considered actions we can take today in the face of the 2013 Supreme Court decision that, according to the distinguished civil rights leader and now Congressman John Lewis, "put a dagger into the heart" of the law. Workshop with Jane Wilburn Sapp, cultural worker, musician, organizer and educator, adapting and composing songs and spoken word poetry advocating for voting rights today. Read more about the Now As Then event series.